Express your deepest feelings to a loved one with ProTrailer Love from Pixel Film Studios. Users will experience a simplified control system that was built from the ground up to minimize controls all without compromising quality. 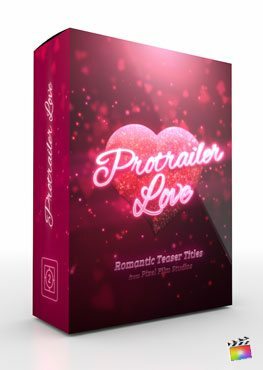 Combined with the 3D text controls located in Final Cut Pro, ProTrailer Love is the most powerful and intuitive system to date.